Facial beauty facial tool that utilizes vibration massage to help give skin a refreshed and youthful look. Use on cleansed, lightly moisturized skin. Press and glide around nose, mouth, eyes and cheek area. This is nice. I enjoy using this every morning to start my day. Thanks, nurse Jamie ...Amethyst is my birthstone this is very purple ...not just a look of amethyst good job!!! Love It. Anytime I eat salty foods my face gets puffy, this is the best depuffing treatment ever! This beauty tool is incredible feels great & and has amethyst stone massager. Leaves your skin looking fresh & taut. I use it it at least once daily. Best facial massager Ive ever used! 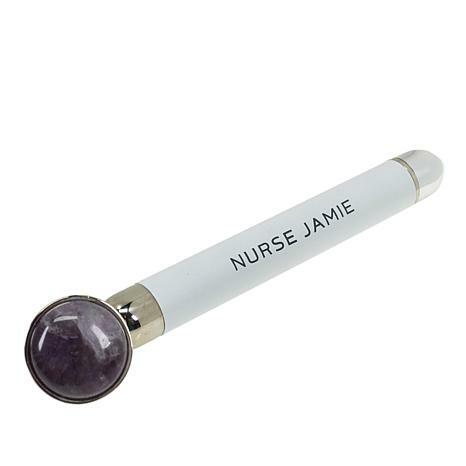 This new Nurse Jamie beauty tool is ahmazing!! The sonic pulse really soothes and plumps my skin. Neat trick? If you use it on your lips it gives you pillow lips. My new favorite beauty tool!